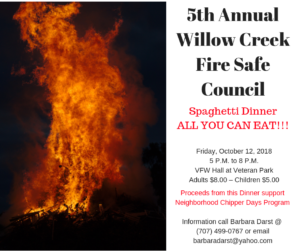 6th Annual Willow Creek Fire Safe Council Spaghetti Dinner ALL YOU CAN EAT!!!!!!!! Menu includes: includes salad, bread, desserts and non-alcoholic beverages and all the spaghetti you can eat! 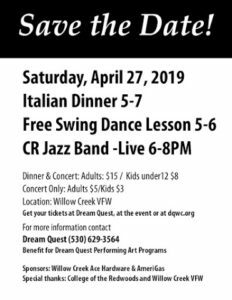 Friday, October 12, 2018 5 P.M. to 8 P.M. VFW Hall at Veteran Park Adults $8.00 – Children $5.00 Proceeds from this Dinner will support the Neighborhood Chipper Days Program Information call Barbara Darst @ (707) 499-0767 or email barbaradarst@yahoo.com Fundraising Event to support Willow Creek Fire Safe Council programs.